Command the Stage is a practical and unique step-by-step guide that walks you through the speech preparation process that successful speakers use to confidently go from blank page to the stage. It’s a short yet comprehensive book designed to demystify and ease the speech preparation process so that you can speak more effectively and have more impact. A particular strength of the book is the unique focus on the your main preparation tool, your notes and how to incorporate strategic elements to create a visual landscape on the page that helps the your eyes navigate it more easily. This leads to better organized presentations and an easier time memorizing material should that be required. Also included: strategies to develop the delivery prior to speaking; alternative ways to make notes; last minute and long presentations; critical pre-event considerations; ways to set up visual overheads effectively if they are needed; and, what to do at the presentation itself. Command the Stage shares proven strategies and insights normally acquired through time consuming trial and error. This information will help you streamline your process and maximize your outcome. "How would you like to always feel comfortable, confident, and competent onstage? 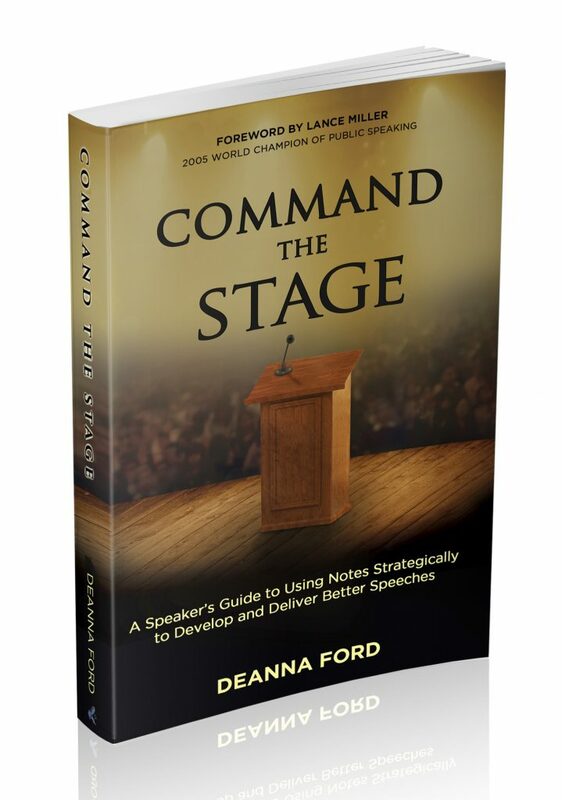 Whether you're speaking to 1 or 1,000, Deanna Ford's book, Command the Stage, will help you deliver polished presentations that touch lives and propel you past your goals." "Command the Stage is packed with practical advice, which is easy to implement with your very next speech. You are smart enough to realize good speaking skills will advance your career. This advice will help." ....OR...check your country's AMAZON site.